Stir with ice and strain into a cocktail glass. I added an orange twist. Two Tuesdays ago for the cocktail hour, I honed in on the Oldfield that I spotted in Pioneers of Mixing at Elite Bars: 1903-1933. The combination of rye, Fernet, and Benedictine reminded me of a Maraschino-less Down & Brown which proved to be quite delicious at Tavern Road. 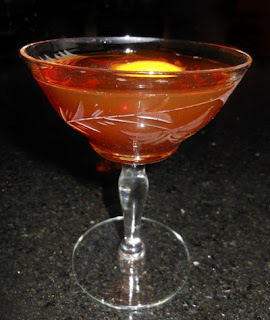 I first thought about interpreting the recipe as a 2 oz rye, 3/4 oz Fernet, and 1/4 oz Benedictine, but I decided to mellow out the Fernet Branca and make it equal parts with the Benedictine. The Oldfield offered an orange oil aroma that brightened the herbal notes that were mostly from the Benedictine. Next, the sip offered up the malt and caramel richness, and the swallow rounded things off with the rye and a minty-menthol note. Overall, I was impressed at how the Benedictine's mint complemented the Fernet Branca's menthol on the finish.